Why Choose Private Yoga Therapy? If you are a beginner, private yoga therapy can help you establish a firm foundation in yoga before you start attending group classes. If you are undergoing physical therapy or seeking to relieve chronic pain, private yoga therapy will complement and support your current program of treatment. If you want to reduce stress and increase your emotional wellbeing, private yoga therapy can help. If you are currently a yoga practitioner, private yoga therapy can help you deepen your practice. All yoga is therapeutic. However, yoga therapy makes use of yoga practices while focusing on the health and wellbeing of the individual at all levels – physical, mental, emotional and spiritual. In yoga therapy, postures and practices are customized to each person’s ability and comfort. What Is A Private Yoga Therapy Session Like? Private yoga therapy sessions with Carol are typically 60-90 minutes in length. 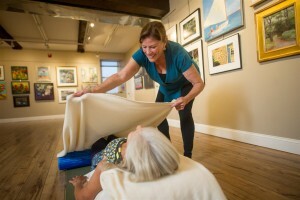 Based your needs, private yoga therapy sessions may include a variety of breathing techniques, yoga postures and other movements, awareness exercises, guided imagery, deep relaxation, and meditation practices. Because each session is dedicated entirely to you, Carol has time to listen carefully to your wants and needs, make physical assessments, and then address those wants, needs, strengths and weaknesses in subsequent sessions. An important difference between a group yoga class and a private yoga therapy session is the amount of time Carol can spend on assessing your current abilities and desires and providing personalized feedback. After the initial session, you will receive an individualized, written plan to follow at home. Allows ample time to ask questions. Practice is modified based on your needs, limitations, and goals. Hands-on assists are offered to enable you to experience proper alignment in each posture. The yoga therapist can use yoga props to safely and effectively modify poses for your body. An initial one 75 minute session that includes assessment of your goals, preferences, and any existing health and stress-related concerns and conditions. It includes an introduction to breath awareness practices, basic warm-up exercises, and a selection of yoga postures that match your abilities. All sessions conclude with a deeply restful relaxation experience. Two additional customized one-hour sessions designed to guide your program and to establish a plan to continue either through a gentle level yoga class and/or home practice. An initial 1.5-hour session includes assessment of your goals, preferences, and any existing health and stress-related concerns and conditions. The session will include breathing exercises, warm-ups, selective yoga poses, followed by a guided meditation experience and restorative relaxation. Five additional 75-minute custom designed sessions feature progressive instruction in beneficial yoga postures and lifestyle modifications. Instruction on meditation and relaxation techniques is also included. A comprehensive, individualized guide for a home practice based on your needs that includes suggestions on how to successfully incorporate yoga, meditation, and relaxation into your daily life.